Bikers in Central Park of New York City have experienced recent efforts by police to enforce traffic laws. Photo by Patricil Complex. Today, the African Development Bank Government of Morocco signed an agreement for €300 million in grants and loans to The Office National des Chemins de Fer, Morocco’s national railway company, to finance a major upgrade of the Tangier-Marrakech rail link. The United States’ hopes for its first high-speed railroad have been momentarily detained as Florida’s governor Rick Scott declined the U.S. federal government’s offer of $2.4 billion towards the building of a high-speed train corridor to connect Orlando and Tampa. Nonetheless, the Obama administration asserted that it will issue Florida the $2.4 billion for other rail projects across the state. The Obama administration has encouraged other states to apply for money to develop high-speed rail. Rhode Island Gov. Lincoln Chafee is among those expressing interest. U.S. biking enthusiasts in Texas mobilized against the Houston-Galveston Area Council’s Transportation Policy Council’s plan to decrease bike, pedestrian and transit funding in the region’s Transportation Improvement Program (TPC) for 2011 to 2014. Advocate groups, including Houston Tomorrow and Bike Houston, compiled and presented a petition to the Transportation Policy Council that was strong enough to achieve a temporary reprieve of the plan. Regional Development Minister of the Northern Ireland Executive, Conor Murphy, launched a consultation on the country’s revised Regional Transportation Strategy. The consultation began on March 16 and will continue for 15 weeks. “At its core, it’s a move towards greater sustainability which will contribute positively to growing the economy, improving the quality of life for all and reducing the transport impacts on the environment,” Conor Murphy said. U.S. Secretary of Transportation Ray LaHood will be meeting with the Apollo Alliance in Portland, Ore. on March 21 to promote President Obama’s proposed budget for the fiscal year 2012, which calls for investments of nearly $30 billion per year in public transit and rail. Portugal’s coastal city of Almada was announced this week as the winner of the 2010 European Mobility Week Award. The contest ran from September 16 to September 22, and included a record-high participation of 2,221 cities and towns across Europe. The contest challenged cities to engage its people in promoting alternatives to automobile transportation and showcase the benefits of other means of transportation on public health and environment. Among its many contest-winning activities, Almada improved road infrastructure for non-motorized transportation and created bicycle park stations and electric vehicle charging stations. The release of a troubling Washington, D.C. Metro crime statistic showed that out of last year’s 2,000 metro-train arrests roughly one-quarter were individuals 20 years old or younger. Metro Transit Police Chief Michael Taborn attributes this spike in crime among young people to the increase in students commuting to schools. The Bahrain government demolished the revered Pearl Monument this week, citing that it would improve transportation flow, though many believe it was an effort to increase the government’s ability to contain protestors. The monument’s storied role as a site for public gatherings will indeed leave a hole in the urban landscape. As an effort to combat its heavy levels of smog, Krakow, Poland proposed a pollution pricing system to tax cars according to the amount of pollution emissions they produce. The taxes would be administered annually to all cars registered in Krakow. The plan is currently being presented to the President of Krakow for consideration. A collaborative meeting in Kolkata City, India on air quality and transportation was held this week, gathering topic experts and representatives from society, academia and press. The inter-city dialogue was formed by both the Kolkata Metropolitan Development Authority and the Kolkata- and New Dehli-based Centre for Science and Environment. The dialogue reached conclusions that included the need for the city to tighten parking norms and shift city developments towards an approach of multi-modal transit. The U.S. Environmental Protection Agency recently released their list of U.S. cities with the most energy-efficient buildings, as deemed by their Energy Star Certification system. Atop the list was Los Angeles, with 510 Energy Star buildings, followed by Washington, D.C., with 301, and San Francisco, with 248. Click here to see who else made the list. 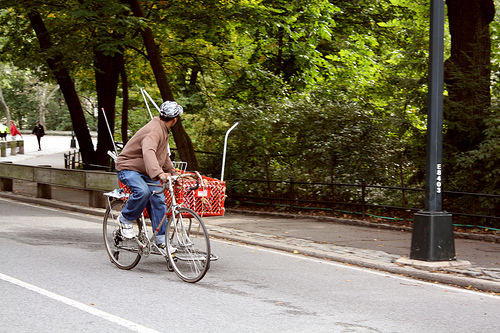 Central Park in New York City has become the venue for a resurgence in enforcing bicyclists to obey street laws. While U.S. law enforcement officials often turn their cheek to bike riders rolling through red traffic lights, the recent “no tolerance” policy exhibited in Central Park has become so fierce that the New York Police Department (NYPD) issued 230 tickets to cyclists since the beginning of 2011. On Monday, Commander of the Central Park Precinct Philip Wishnia said, “I do understand that for the last 15, 20, 30 years you guys and gals were cycling in the park and nothing like this was enforced.” Public opinion on this new trend has been decidedly mixed. In New York City, the Five Borough Farm Project of the Design Trust for Public Space was awarded $90,000 from the Doris Duke Charitable Foundation to research and spur a new plan for developing New York City’s urban agricultural activity. Results from a study by Latitude Research and Next American City indicate that while drivers value the freedom and sense of control that a car provides, the availability of real-time mobile information and its capability to influence in-the-moment decisions about current traffic conditions might prove impactful in encouraging individuals to adopt public transit options. This week in Bangkok, Thailand, Honda Automobile debuted their new commuter car, the Honda Brio. The vehicle is expected to set the standard for eco-cars in the areas of design, packaging, cabin comfort and fuel efficiency in Thailand. The Montreal Society of Transport launched its new late-metro alert system last Friday. The service sends emails or text messages to subscribers with information on late metro trains. The car company Mercedes-Benz announced this week that they will set up facilities in Vancouver for producing fuel cell stacks—a key component of fuel cell-powered electric vehicles. Tags: Barack Obama, cars, clean fuels, environment, Florida, fuel efficiency, innovation, Ireland, Latitude Research, mass transport, Mercedes-Benz, Montreal, Morocco, New York City, Next American City, Poland, Portland, public space, Quality of Life, research, technology, Texas, Thailand, United States, Vancouver, Washington, D.C.